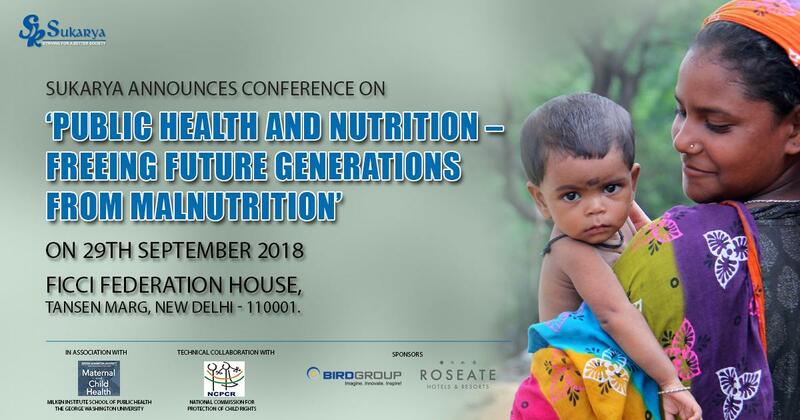 SEATTLE, September 18, 2018 – Academicians, policymakers, nutritionists, health care professionals, scientists, researchers, activists and other subject matter of experts from all over India will gather on Sept. 29 at the FICCI auditorium in New Delhi to confer on how to free future generations from malnutrition. The call for action is due to the Global Nutrition Report 2017, which emphasizes the urgent need to integrate actions on global nutrition if India hopes to meet its Sustainable Development Goals of Agenda 2030. According to the data revealed by the report, India is facing a serious threat of under-nutrition where more than half of the women of reproductive age suffer from anemia. About 38% of children under the age of five are affected by stunting and about 21% of children under the age of five are defined as wasted or severely wasted. “Health of women, children and adolescents is one of the most prominent and pressing agenda not just for India but for the entire global community. It is a long-term need to free women and children from the prevalence of malnutrition. It is the Time to Act Now,” said Meera Satpathy, the founder and chairperson of Sukarya. Health of women, children and adolescents is one of the most prominent and pressing agenda not just for India but for the entire global community. It is a long-term need to free women and children from the prevalence of malnutrition. It is the Time to Act Now. In a technical collaboration with the National Commission for Protection of Child Rights (NCPCR), Sukarya is organizing this conference also in collaboration with the Milken School Institute of Public Health (MSIPH) of the George Washington University, Washington DC. The Director of the Maternal & Child Health Program of the MSIPH, Dr. Amita Vyas will be speaking at this conference along with her two colleagues, Dr. Nitasha Chaudhary and Dr. Karen Landry. There will also be speakers from Bangladesh and Nepal. Sukarya has been working extensively in health and nutrition for the past two decades and has served around 5 million women and children in around 600 villages and 90 slums in Delhi, Haryana and Rajasthan. Its focus has especially been on addressing malnutrition among the most vulnerable sections of society.